New non-numeric “custom” URLs for Google+ pages. Google is actively rolling out non-numeric “custom” URLs for it’s users and pages. This +NextScripts is not our page ID and it cannot be used in our API. 1. Login to your account, go to “pages” and select your page. 2. You will see the front of your page with the new URL. Click “Manage this page” button. 3. You will get to the dashboard and dashboard will show the numeric ID in the URL. Alternately you can just click “Manage this page” right from the pages selection. Google recently changed Google+ design a little bit and as part of it the “Page” icon has been removed from the business pages. While now profiles and business pages look almost exactly the same, there is still a way to tell the difference. Please look at the top right corner under the cover image. 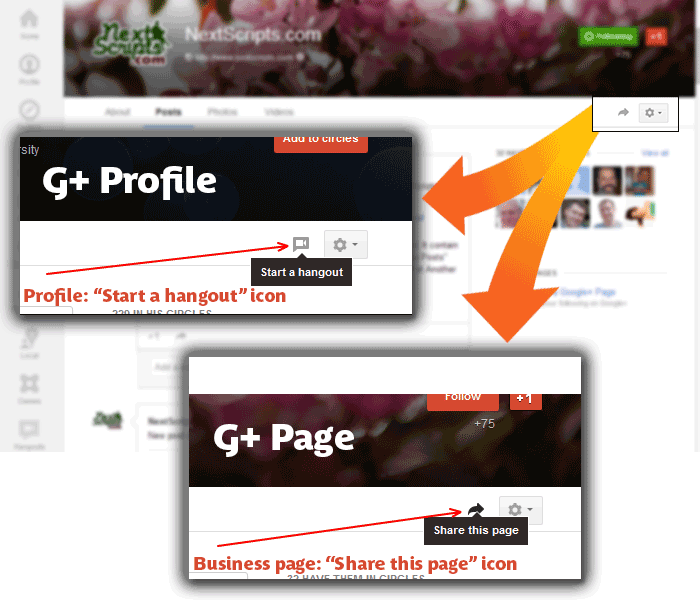 If you see “Start a hangout” icon you are on the profile, if you see “Share this page” icon you are on the business page. Google+, 2-step verification and auto-posting. Plugin could not be compatible with two-step verification. Plugin have to login to your account in order to make a post. 2 step verification requires entering the code from your phone. Plugin can’t take a look at the screen of your phone each time it needs to make a post, so it’s not possible for it to login like this. Also plugin could not be compatible with “application specific passwords”. Application specific passwords could be used only in the non-browser applications, but Google+ is accessible by browser only. If you are concerned about your personal Google account and want to keep 2 step verification on, just create another account, make it admin for your Google+/Blogger page and use it for auto-posting. New version fixes the Google+ posting as well as some connectivity issues for other networks. * New – Version 2.0.3 Beta is available to try. * Bug fix – Removed many (\) Slashes from some Google+ Posts. * Bug fix – Tumblr Authorization fix. * Bug fix – New LinkedIn oAuth model support fix. * Bug fix – Twitter New “Smarter” Twitter 140 characters limit handling fix. * Bug fix – Google+ Fix for new interfaces. * Improvement/Bug fix – New “Smarter” Twitter 140 characters limit handling. URL won’t be cut anymore. Google just introduced a Google+ “Share” button. The new button allows webmasters to let visitors to spread a link to the page among circles on Google+ Social Network. When visitor clicks the button, there is an option of sharing a page with anyone or only some circles in their network.The Share button joins, not replaces the existing “+1” button, which allows Google+ members to endorse a webpage or an article. The Share button is already available for integration. More instructions are on the ‘Google+ Developers’. Unfortunately this button does not changes the way the Google+ API works. The API is still read-only, so if you as a webmaster want to share your own page or blog post on your own G+ page you still need to do it manually or use the third party plugin or library.